We attended a Press Event highlighting Horizon Zero Dawn in Manila, Philippines, and we played the first three chapters of the full game. Going in, I didn’t have much information on what Guerrilla Games’ new IP is all about, but after spending around two hours with the game it’s safe to say that they are sitting on something special. There are so many open world games now that there seems to be a standard formula that makes the whole experience stale for me. This was my worry with Horizon Zero Dawn, especially since Guerrilla Games is best known for the Killzone franchise. This project as a company is completely out of their comfort zone, so tackling a type of game with this scale is questionable. But after playing, I’m not so worried anymore. I actually can’t wait to jump back in at the end of this month and take down these animal-like machines. Horizon Zero Dawn is an open world action game set in a post-apocalyptic world where nature and machine have taken over. You play as Aloy, a skilled hunter that felt likable during the first few chapters of the game. We can’t say much about the story but the pacing to introduce the player to this world and the tutorial of how to maneuver Aloy was paced well to get you ready for the open world section of the game. The post-apocalyptic setting isn’t so unique anymore since there’s so many out there already, but this one in particular, felt like the complete opposite of what we’d come to expect in settings like these. The world felt vibrant and alive. It was inviting. It didn't feel bleak or run down. Nature is now king and it’s very clear in the areas I was able to explore that Aloy is sitting on a lost civilization, just waiting to be unearthed. Combat felt natural once you get accustomed to the game’s controls. Weak points can be found in the enemies I faced thanks to a scanner feature (similar to the Batman Arkham series), which invites precision with Aloy’s bow to take down these machines faster. Aloy has her trusty spear for when enemies are close, but if you are more of a silent player, there are always bushes or tall grass to crouch on to get that quick stealth kill. The ability to tackle it silently is present, but I find that whichever you choose to tackle a specific situation is equally effective. 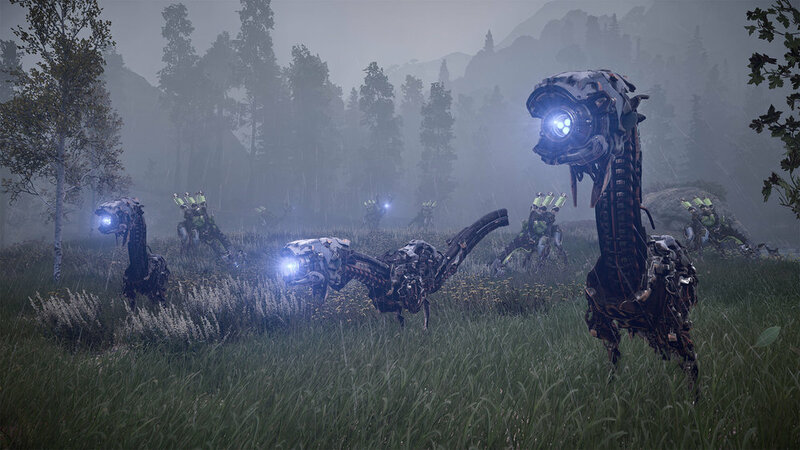 I also see the potential of exploiting the enemy weak points by experimenting with Aloy's traps and weapons, which gave me the impression that there will be a specific way to take down more difficult machines. Horizon Zero Dawn has crafting and item gathering, as well as a skill tree (three branches) that will make Aloy a more effective hunter. Modifications are also available to improve a specific stat of your equipment, so there’s a lot of elements in this game that was present once I was given complete freedom. I didn’t dwell too much into these mechanics but it’s good to know that it’s there to further customize Aloy’s weaponry and skills. Plus, I was kind too busy killing bunnies and these machines. I was having fun roaming around, killing whatever moves. Sidequests were present but it’s hard to tell how much thought was put into these quests since only a handful were available to us. A dialogue wheel is also thrown in the mix during specific discussions in the game. Just like other dialogue wheels, it can be used to gather more information about the current situation, but it also seems like we can make Aloy react in a specific way. You can come out more compassionate, aggressive, etc., it’s hard to gauge how big of a factor it will be with the overall narrative, or if it will make any dent on how Aloy is as a character, but it seems they added that element to play with the player’s morals, which makes this a game filled with bits and pieces making it feel different. What More With The PS4 Pro? As I was playing, it’s hard to avoid on how detailed this game is when it comes to the environment and character models. Animation is also impressive since the emotions, while not perfect, is brought out well to really understand what each character is trying to portray through movement. Also, these machines you face each have their own set of movement and characteristics. While some are aggressive once they are alerted, some flee if you engage them. As much as they are machines, how they are reacting and moving felt like they were part of the canvas as if you are stumbling into the creature's natural habitat. We also tried to find issues with the build, to really test it, but I hardly found any problems that would detach you from the experience. They stated that what we were playing was the full build of the game - with that in mind, the first few hours of Horizon Zero Dawn will be a smooth one. The PS4 didn't seem like it was struggling when the screen was busy, no frame drops were present during my time with the game's open world section. It felt polished, and it looks like all is good for release at the end of the month. The first quarter of 2017 was impressive enough with the titles released so far. If you are a sucker for open world titles, or you need something completely out of the box, pretty much throwing a good twist on an overcrowded genre, then Horizon Zero Dawn is one title you should keep an eye on. Horizon Zero Dawn has been in development since 2011. This is the first time Guerrilla Games' has revealed a new IP since they announced the Killzone franchise back in 2003. Guerrilla Games confirms that there will be a day one patch on release and it's at a decent size. Horizon Zero Dawn will be out on February 28 exclusively on the PS4.